Hello friends! A bit worn out today from all the snow we’ve gotten lately and all the shoveling I’ve had to do. It is pretty sad, but this is the most snow we’ve had on the ground at one time in years. For the past several years there have been so many warm thaws by now that we’ve been left with very little snow cover, up to knee high at most. Not this year! This year it looks more like winter used to look and after six inches of snow Thursday and another six inches last night, it’s piled thigh high. It was blindingly beautiful with the sun glaring on it today. This being the end of February I am more inclined to wish there wasn’t so much snow. I want to ride my bike outdoors! Maybe I need a fat bike! I never thought I would say that. I don’t really like the look of fat bikes, they are the tanks for the cycling world, but I have to admit you can ride them through snow which comes in handy this time of year. Of course I could also just figure out how to fit out my gravel bike for snow. But since I don’t have a heated garage where I can wash off and store my bike after riding, I would also need to figure out an indoor way to clean and dry the bike. Not going to happen this year no matter what, just something to put on a list to think about. Anywho, it is also going to be a long time before anything happens in the garden. 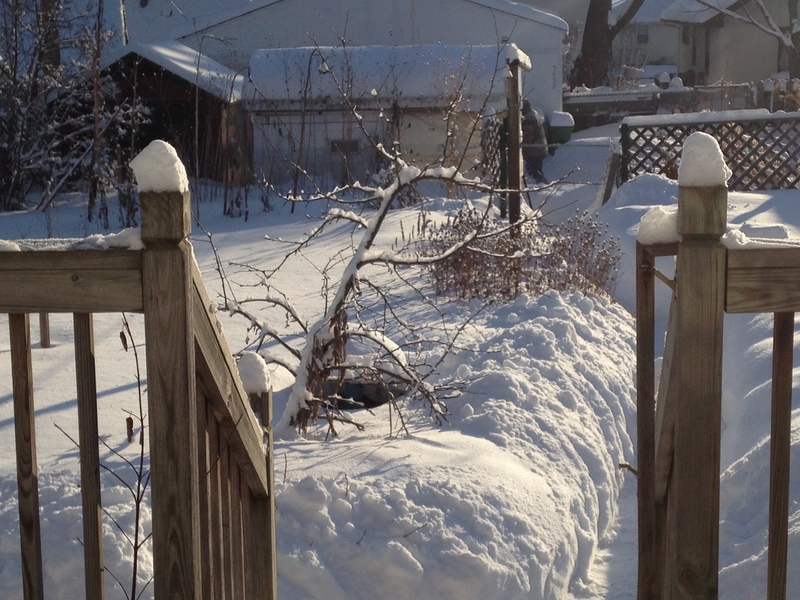 But, snow is good for the garden in more ways than I thought. Not just the moisture when it melts in spring, and not just the insulation it provides for plants. Fun fact! Snow also has nitrogen in it. Rain has nitrogen too. It isn’t a significant amount, but it’s there. Learned that from a gardening podcast earlier last week. While there is no green outdoors, there are growing green things indoors. Thursday evening when I lifted the dome to check on my seed pots there were sprouts just poking up from the soil. Huzzah! By Friday evening the little sprouts were already tall and looking for light. So Saturday I had to get the grow light out and set that up. 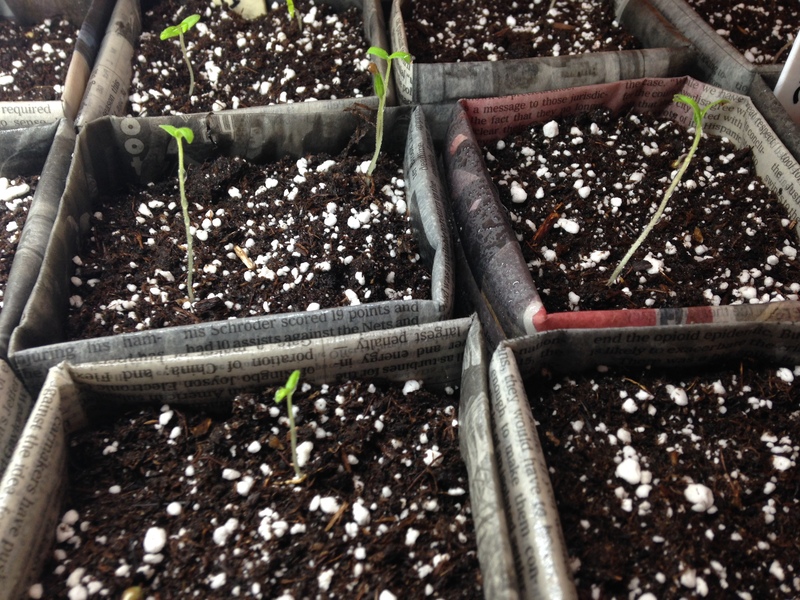 The sprouts are tomato sprouts. The peppers and eggplant are still debating on the whole sprout thing. But they always dither. They should be making up their minds by the end of this week. I still don’t know what the critter with the tunnel by the compost bin is. After the Thursday snow it had to dig itself out. Yesterday’s snow buried its tunnel again and so far it has not dug itself out. It’s supposed to be above freezing every day this week so maybe it is taking its time and letting nature do some of the work. Bookman saw prints after the last snow, he said they were kind of big but he didn’t know what they were. By the time I had the chance to look, all the busy squirrels had been through the area and obscured the tracks with their own. Now to completely swerve away from snow and cycling and gardening to food. A good many folks I’ve met think vegans are so deprived and all we eat is lettuce and carrots. Wrong! Chocolate Covered Katie, one of our favorite plant-based food bloggers sent out a Girl Scout themed donut recipe this week and desirous of a decadent treat this weekend, Bookman baked them up. Yes baked. We even have a donut pan. Take a gander at the tagalongs peanut butter donuts! We tried to eat them all but had to put a couple in the freezer. These are so freaking delicious! And it has the best recipe direction ever. To make them oil-free, just use more chocolate. Can do Katie! Bookman and I are now wondering what other recipes we can make oil-free by adding chocolate. It sounds like you are having more 9f a winter than I’m having on Long Island. Today I discovered a possum and her baby (not too small) burrowing in the compost. Not a fan of these creatures. Antoinette, I wouldn’t call it a good old fashioned Minnesota winter, but it’s more winter than we’ve had in a long time. Kind of refreshing in a weird way. Oh, a possum! They are fascinating animals. Ugly, but fascinating. Hopefully my critter is not a possum, that would not be a chicken friendly neighbor. I did not realize snow was good for plants. I think I just assumed, it’s like ice. Which when we get ice warnings they tell us to cover plants. Anyway, moving on to the donuts because that’s the major news story here – haha… I have bookmarked that recipe and will see if my husband will help me make it. Love donuts! Iliana, snow is good for plants that are adapted to it, your plants in sunny Texas, maybe not so much 🙂 Besides these donuts, the author has many other donut recipes on her site that Bookman and I are not drooling over. I hope you and your husband get to make some up and enjoy! Hi Stefanie, we have just had our first snow for 4 years in Kent, in South East England. It was very pretty for the first two days, and it has been kind of nice to hunker down at home. It’s snowing again now, and is very cold. I think by Sunday though the novelty will have worn off, and I too will be longing for spring. I sowed my first few packets of seed a couple of weeks ago, and think I can justify a few more just as soon as this snow goes! Ali, wow, your snow is a big deal. I hope it has melted by now. I understand about the novelty wearing off! Hopefully it doesn’t interfere too much with your gardening or damage any of your plants! No, I don’t think there is any damage. All back to normal now, and ready for spring! heh, Jenny, I think it is/was mice or a rabbit. We’ve gotten quite a lot more snow and the hole is covered over and nothing dug it out again. Then we had lots of melting and now more snow and there is no further sign of the critter. So it is either hunkered down or has moved elsewhere, which makes me think it might have been mice. Possums are great! We had one come up to our deck window several years ago and look in! Freaked out the cats! I turned the outside light on thinking it would scare it off and it just sat there looking at me. It finally shambled around the side of the house and into the front yard just as Bookman was getting home from a late day at work. It was dark and he thought it was a funny looking cat and started trying to shoo it away. It ignored him and when he got up closer he realized it wasn’t a cat and backed up and came inside. Haven’t seen another one since and that’s ok because they are not friends of chickens.